The MTVG 39Flex stands as one of the few native UHD trucks on the road today. Live remote production specialist Mobile TV Group (MTVG) has been building at least two production trucks and support vehicles a year for network television sport and entertainment shows for the past 20 years, but few are as versatile and future-proof as the company’s new 39Flex truck. Designed and built by MTVG engineering staff from the ground up to support 4K projects - complete with a fully networked 4-wire 3Gbs infrastructure - the new rig can support 4K UHD (3840 x 2160), full HD (1920 x 1080p), and full High Dynamic Range (HDR) capability on all (Sony) cameras. Another highlight of the new multi-format truck is a series of networked production servers from EVS that handle slow-motion replays and highlight clip reels. In fact, 39Flex boasts six Replay Operator positions that are linked via an EVS LSM Connect system that provides instant access and efficient control of all clips, playlists and metadata created with the on-board LSM Controller. It also helps operators search and organize clips or playlists, edit on-air, or add on-the-fly effects and animated transitions. The main replay area features three EVS XT4K Full Editing Replay Servers with 16 channels of embedded audio. Each XT4K provides the operators with 2 channels in/2out in 4K/UHD/HDR or 8 in/4 out in HD. The XT4K servers can be split into two 4 in/2 out operator positions in HD. The new EVS XT4K servers allow Mobile TV Group to ingest 4K feeds, but also include a 10-bit codec that enables support for productions using HDR as well as the two sample interleave format for QUAD-SDI. 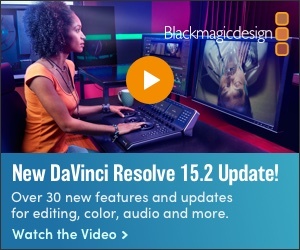 And in case it becomes necessary, the server has expanded support for 12G-SDI and native IP connectivity. 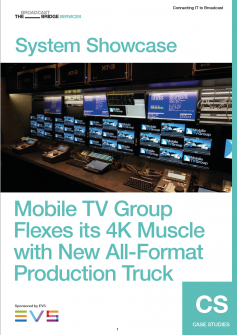 With this capability, operators on the truck can easily switch from a total of 12 UHD-4K channels to over 30 Full-HD 1080p channels whenever needed. In February, the 39Flex truck was deployed to help produce the live AT&T Pebble Beach Pro-Am golf tournament telecast in UHD. There were three LSM operators for the 4K production, all running 2in 2out in XAVC-Intra class 300 codec at 600 Mbps. The operators used the EVS XNet network to transfer clips and exchange content between the three servers. Operators worked fast and reliably, just as if they were working on an HD production. Follow the link below to read the full System Showcase. A dozen Sony HDC-4300 4K cameras with HDR acquisition capability travel with each project (39Flex can accommodate up to 16), making high-quality, high-frame rate acquisition a reality. The software-upgradable camera, with its three 2/3-inch 4K imagers, can be used in either mode at any time during a production, including 3x super slow motion as standard and up to 8x super slow motion with an upgrade. This provides a maximum frame rate of 479.52 fps (60Hz) or 400 fps (50Hz). In the end it’s the HDR capabilities that makes the UHD pictures produced on the truck so stunning. Other 4K UHD projects completed with 39Flex include those for CBS Sports (The Masters), NBA games, MLB games and UFC pay-per-view events. The MTVG 39Flex stands as one of only a few “native 4K” trucks on the road today. It’s built for tomorrow using today’s latest technology. Management expects 4K projects to increase in number throughout the year, as more consumers purchase compatible TV sets for their homes. Want to know more? Follow the link below to read the full System Showcase.